Having just read this post by EMC's Chuck Hollis about Private Clouds, where he says "I'm sort of describing the "golden age of mainframes" -- roughly the 1970s and 1980s. I was there" I'm wondering which world I'm from? I'm from the "Windows world of New Technology" – that being Window NT and Active Directory. A world of blue screens of death, GUIs and Windows 95, COM, WINS, MSMQ and plenty of Service Packs. For sure, there's a "We're all Online" we're there now – Web 2.0 and always online, mobile, Facebook and social media. What's the new world that's forming now for the next generation of IT Pros? What's next as virtualisation comes to the fore, centralisation of services come of age and applications become less dependent on physical infrastructure? Follow http://twitter.com/sakacc if you don't already. Making Vblock easier to understand.. I am lucky. I'm getting my hands on a Vblock, I'm told it's the first official Vblock in the UK, so they are rare things. A Vblock is a whopping lump of computing power from EMC, Cisco and Vmware. These guys have created the Virtual Computing Environment (VCE) Coalition. The Vblock is a pre-engineered, integrated stack of storage, servers and switches with a virtualisation layer and a complete set of management tools. 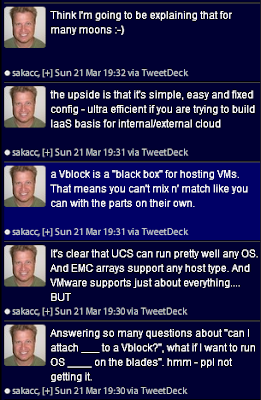 There are a few Vblock models available based on different EMC storage platforms that support thousands of VMs. The idea is that service providers and systems integrators will be able to create on-demand private and public clouds using Vblock solutions - it's cloud computing in a box. Resources from a server up to a full virtual data-centre can be provisioned, operated, managed and torn-down inside the Vblock environment. Sounds easy. BTW, it's understood that Vblocks will be able to connect and interoperate with each other, sharing computing capacity and resources across data centre environments. That sounds pretty exciting, if a little challenging in practice. If the analyst predictions come true, then enterprises will buy less hardware in the next few years and move computing to providers of cloud-based services. That's got the big vendors a bit worried - CIO's, and CFO's especially, are looking to buy services on-demand, pay for what they use and move to a consumption-based model that shifts from a capital purchasing model to an operational cost. I bet the EMC sales guys are a bit worried too! My team are just starting a proof of concept deployment on a Vblock-1. I'll let you know how we get on.